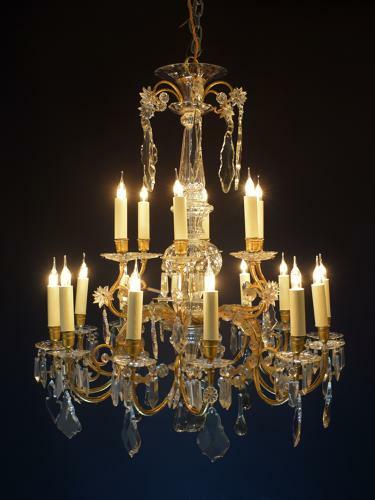 A superb quality, gilt bronze, sixteen arm lower branch light and six upper branch light in the style of Baccarat. Hung with faceted and cut glass black drops with bathroom pans hung with icicles and buttons. The central stem is of exquisite quality, handblown, cut and polished. This chandelier has been newly electrified, however it was originally made for candles. The bottom terminated in a faceted cut glass ball. French Circa 1860.